IFO files contain important information about the DVD chapters, subtitles, audio tracks, etc. Sometimes you may want to convert IFO to MP4 so that you can play the files on your MP4 players like iPhone, iPad, PSP, Archos, etc. Many software can convert a DVD IFO files to an MP4 video. 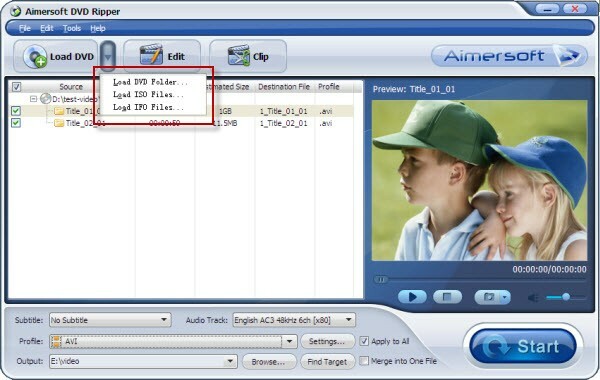 Among them, Aimersoft DVD ripper software can be the best choice to rip DVD IFO to MP4 with smart video editing features. 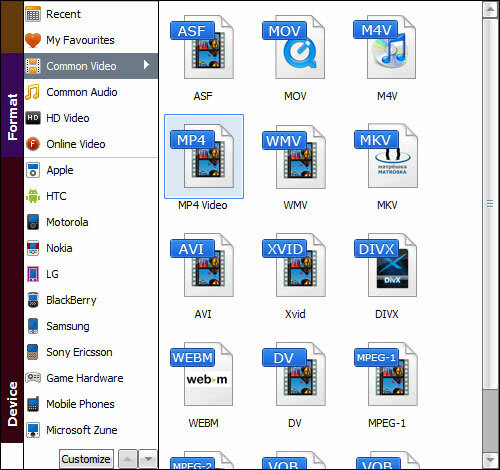 Besides MP4, it can also convert IFO to all other popular video formats like AVI, MOV, MKV, FLV, ASF, WMV, MPEG, etc. Furthermore, 150+ video presets for portable devices like iPhone, iPad, iPod, Archos, Zune, Zen, Xbox, PSP, etc. are provided to let you get videos with the best settings for playing on a certain device. If you are using a Mac, please turn to Aimersoft Mac X DVD ripper. Now download the right version and follow the below steps to rip IFO to MP4 in just a few mouse clicks! After downloading, install and run the IFO converter. Note that the below guide uses the Windows (Windows 8 included) version screenshots. The way to rip IFO to MP4 on Mac is the same. Just make sure you download the right version according to your situation. Add the IFO files you want to convert to the ripper by clicking "Load IFO Files" on the pull down menu of "Load DVD". Click "Profile" and choose the output video format as "MP4". If you like, you can click "Settings" to adjust the video resolution, frame rate, bit rate, etc. When all the settings are "OK", click the "Start" button on the main interface to start the IFO to MP4 conversion. When the conversion finishes, hit "Find Target" to get the converted MP4 video files. When you’re given a choice between IFO and MP4 video files, chances are, you won’t think twice about what you’ll choose. It’s a given that you’d pick MP4 over IFO anytime of the day. Who wouldn’t when MP4 is the more popular and the more compatible file? But there is something about IFO files that you should also know. As such, they are easily recognized and played by any DVD player. Therefore, if you intend to burn the file onto a disc and then put it in a DVD player for later viewing, the IFO file will work for you better. While MP4 contains the full video, the IFO will go the extra mile and will provide you with a movie file that is complete with menu and subtitles. These are features that you simply won’t find in an MP4. If you are very particular about the movie that you play, you can be more sure with the IFO than the MP4. Because the MP4 is a standard format, it may come in different bit rate, resolution, and properties. The IFO, on the other hand, always follow DVD standard. No matter where you use an MP4 file with, it will be recognized and played by most devices. Computers, mobile phones, portable players, and tablets can handle these files just fine. What’s so great about MP4 files is the fact that you can share it online and offline very easily. These files don’t take too much space, yet they can still provide good quality videos at the same time.